Saturn transit from Scorpio to Sagittarius on 26th January 2017. Saturn leaves your 3rd house and will be in 4th house till next transit (till 24th January 2020). From the 4th house, Saturn aspects your 6th, 10th, and 1st house. 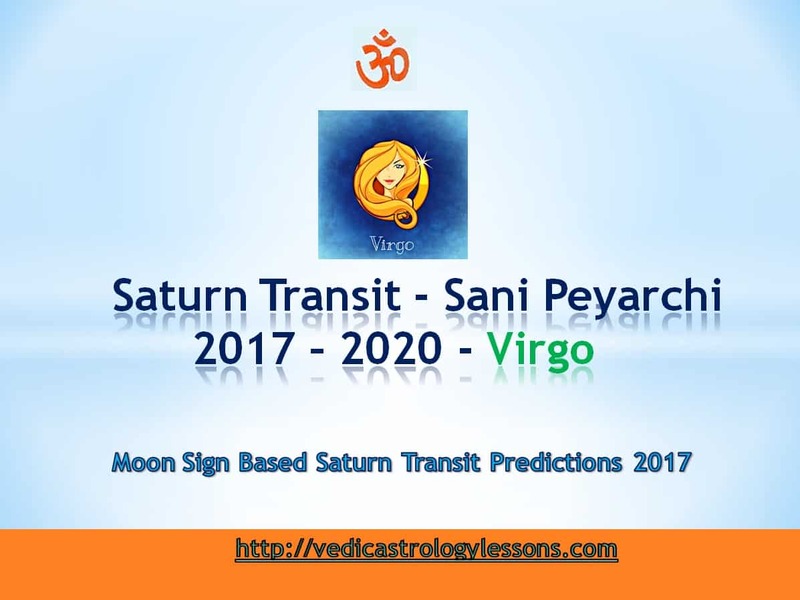 Saturn Transit 2017 effects on Virgo: Planet Saturn is moving from your 3rd House to your 4th House of Sagittarius. The transition of Saturn from your moon sign to your 4th House is called Ardashtama Sani. But do not get worried or apprehensive. The effects of Saturn will always depend on the planetary locations at your birth time. So the effects can change depending on the favorable gaze and position of the planets. Planet Saturn is the ruler of the 5th and 6th House, according to your sign. His presence in your 4th House might spell new career opportunities for you. Though some might face delays in getting a job, you have to first hold on to the job offered, before trying for the job of your dreams. The presence of Saturn in your 4th House spells some troubles at the workplace. So you have to be very alert, sincere and adjusting to your work environment, even though you might hate the job. Do not take frequent leave of absence from work. Do not try to resign from your job during this time. This is the time to just grit your teeth and work through the tough times. Only if the new job offer is concrete enough in your hand, you can leave your present job. After this Saturn transit, You will start seeing good changes in the way the society receives you. Unnecessary traveling due to your work will reduce and see you firming up on a location. Due to the planet, Saturn in your 4th House will see the workload increase and the pay remain low. So you have to work really hard and pass through these tough times with a tough skin. Only then you can gain real ground in your workplace. Otherwise, you will be half-hearted in your job, resulting in either resignation or loss of a job. Venus is the ruler of the 2nd House of your Ascendant sign. This spells the return of lost money and cash inflow will increase. Forgone properties, ornaments will come back to you. Your verbal skills will increase and your economical problems will now change for the better. Your lethargy and confusion will be replaced with vitality. Be alert when undertaking new ventures. Do not interfere in the problems of your brothers and sisters. Though they are supportive of you, you might face some stress due to them. Some of you might get estranged from your loved ones. Good news will reach your ears in a belated manner. You might get the opportunity for buying new land, house, and vehicles. Be careful of your mother’s health. Unknown diseases might affect you, especially problems with cold might affect your health. So take care of your well-being. Based on your current Dasa and Bhukti(Subperiod) the effect of this Saturn transit for Virgo sign will change.